Vancouver Rheinlander Oompah Pah Band is a Vancouver, BC based group that plays authentic Oktoberfest, Oompah Pah Pah and Polka music. This band plays the most famous Oompah Pah Pah "Drinking Songs" and Oktoberfest music made popular at celebrations in The Munich Hofbrauhaus. Oktoberfest drinking songs are not only a Bavarian tradition, but also, a way for all the people in the community to come together and pay tribute to the year's bountiful harvest. 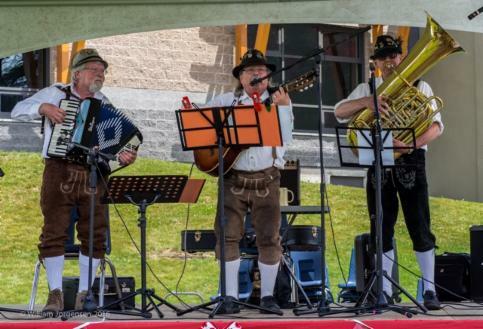 The Vancouver Rheinlander Oompah Band likes to propose a personal toast called "ein prosit der Gemutlichkeit" to each participating neighbor and guest who attends the celebration. The toast signifies friendliness, acceptance, warmth and cordiality, the idea of rejoicing in relaxation with friends and family. With the drinking of good beer and the dining on good German food, the band likes to say goodbye to another good year celebrating in traditional Bavarian style. 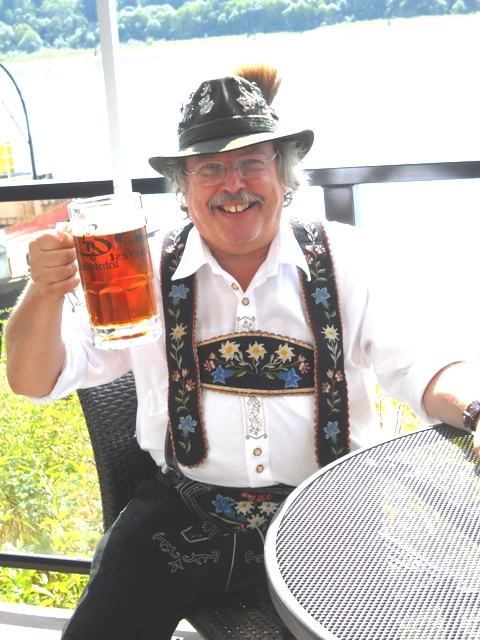 Peter Wishes You "Ein Prosit"
magical experience of Oktoberfest is expressed with the popular "Schunkle Lieder" medleys. 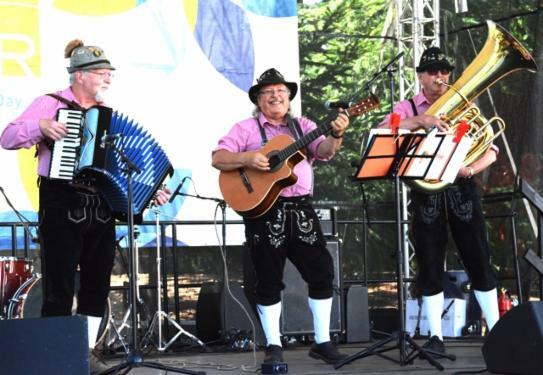 The Vancouver Rheinlander Oompah Band makes schunkeling fun at any Celebrative Event. What about the fabulous happy sounds of the Beer Barrel Polka? Yes, this dance is lively and fun for everybody to enjoy. It will keep your toes tapping and your feet gliding across the floor. Richmond, BC, Oktoberfest is No. 1 and everyone enjoys good food, good music and lots of dancing and beer drinking. Also, we musn't forget what happens to peoples' hearts when The Vancouver Rheinlander Oompah Band plays those popular ballads like "Lili Marlene" and who can forget the polka band beat of The Beer Barrel Polka and "The Wooden Heart Song" AKA "Muss Ich Den" by the "King of Rock & Roll - Elvis"
And don't forget the famous Oktoberfest Schuplattler dance performed by the Edelweiss Dancers. The Schuplattlers are a very attractive addition to our show when we play larger venues. Finally, The Ziky Zaky - Ziky Zaky - Hoy Hoy Hoy Chant is performed throughout the event in lively form with Peter holding a seidel of beer up for all to see and to join in for a rousing toast of "Ein Prosit Der Gemudlichkeit." Follow this with a polka band special and Wow! Don't try to say that last word when you have had too much beer. Join us for this wonderful yearly festival from the third week of September through, to the end of October or have a festival of your own any month of the year. You could call it Novemberfest, Marchfest, or Julyfest, whatever month you like! Great Music That Feeds The Soul. Oktoberfest Drinking Songs, Polka Band Music, Tangos, Schunkling and Swaying Waltzes for audience participation, The Jager March or Ball, The Chicken Dance, The Twist, The Boogie Woogie, Western Swing, Country Swing, and Pop Rock are just a few of the highlights that accompany an evening with the band. Music from the 40's, 50's, 60's and 70's is another great feature of The Rheinlander Oompah Band and they can play any dance venue.